David Crombie is former Mayor and Member of Parliament. He founded the Waterfront Regeneration Trust as a charity in 1999 with support from waterfront communities as a way to continue the extraordinary work begun through the Royal Commission on the Future of the Toronto Waterfront and Waterfront Regeneration Trust agency. At the core of this work was the creation of the Great Lakes Waterfront Trail--one of David’s finest legacies. Crombie was elected to Toronto’s city council in 1970, and became Mayor of Toronto in 1972, ushering in an era of socially responsible urban development inspired by thinkers such as Jane Jacobs. Crombie was enormously popular as mayor, being re-elected in 1974 and 1976 with large majorities. With his great public appeal and small stature, he was repeatedly described in the media as the city’s "tiny, perfect mayor". He left City Hall in 1978 to move to federal politics, winning a by-election as a Progressive Conservative candidate that gave him a seat in the House of Commons. Crombie served as Minister of Health and Welfare in the minority government of Prime Minister Joe Clark. When the PC party came back to power in the 1984 election, Crombie was appointed Minister of Indian and Northern Affairs, and later Secretary of State and Minister of Multiculturalism. After retiring from federal office in 1988, David Crombie was appointed by the Government of Canada as Commissioner of the Royal Commission on the Future of the Toronto Waterfront. In 1989 the Commission received an additional mandate from the Provincial Government. From 1992 to 1995 David Crombie headed the Waterfront Regeneration Trust Agency, established by the Province of Ontario to implement the 81 recommendations in the Commission’s final report. 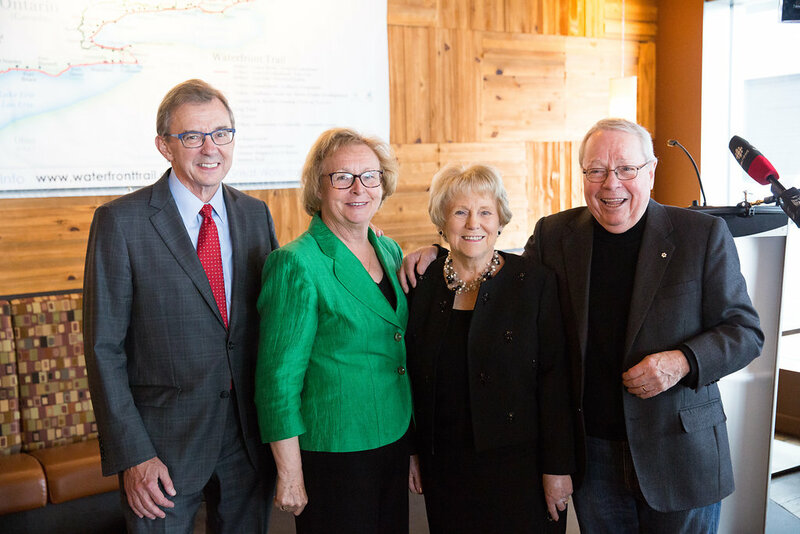 In 1999 David Crombie founded the Waterfront Regeneration Trust Corporation, a charity continuing the work of the Agency, with a focus on the completion, expansion and promotion of the Great Lakes Waterfront Trail as catalyst for waterfront revitalization. Crombie was appointed Ryerson’s first chancellor in 1994 when the polytechnic was granted university status. He served in that role until 1999. Throughout the years he served in various advisory capacities to city and provincial governments relating to urban issues including a stint as CEO of the Canadian Urban Institute. In 2004, Crombie was appointed an Officer of the Order of Canada. In 2012, he was made a member of the Order of Ontario. Pauline Browes is one of five Canadian representatives appointed by Environment Minister Peter Kent to the Joint Public Advisory Committee for the Council of Environmental Co-operation. This commission was established in 1993 when the NAFTA was signed to deal with North American Environmental issues. She was a Member of Parliament between 1984 - 1993 and Federal Cabinet Minister responsible for Indian affairs, employment and immigration, and the environment. She was Special Advisor to the 1995 Ontario Provincial Election Campaign for Premier Mike Harris and is currently Vice Chair of the Ontario Environmental Review Tribunal. Pauline was one of the founding members of the Save the Rouge Park Alliance Board and has been a passionate champion of protecting and restoring the sensitive ecosystems along the Rouge River. Her work resulted in the creation of Canada’s first Urban National Park in the Rouge Valley. Keith Laushway is a tax lawyer with over 20 years experience in private practice, including 6 years with a major international accounting firm. His areas of expertise include corporate mergers, acquisitions, divestitures and reorganizations, public offerings, corporate, personal and estate tax planning and tax appeals. He has extensive experience in providing advice to businesses in a wide range of industries and to numerous registered charities. He is an avid hiker who has travelled internationally to enjoy some of the world’s finest trails. Ann Mulvale has been active in municipal politics for over 18 years served as Mayor of the Town of Oakville (1988-2006). She is an active volunteer in many organizations and a successful community fundraiser. Ann Mulvale served as Executive Director of the Oakville United Way from 1986-1989 and is currently serving a two-year term as President of the Association of Municipalities of Ontario. Marlaine Koehler is the Executive Director of the Waterfront Regeneration Trust. She has spent the past 20 years developing and leading the innovative partnership regenerating the Great Lakes waterfront through the creation of the spectacular Great Lakes Waterfront Trail. Under her leadership, the Trust has garnered nearly $40-million in public/ private investment in the waterfront and brought together an innovative and active community partnership of 140 communities, First Nations, and NGOs. Together the Trust and its partners are leading a movement to regenerate and revitalize Canada’s Great Lakes. Marlaine serves on a number of committees and minister’s working groups related to trails, cycling and waterfront projects. Vicki is a Certified General Accountant, with 32 years of experience in the environmental field, including 16 years as General Manager of Credit Valley Conservation. Highly respected and well known in the field, Vicki has worked at many levels. At the provincial and local levels she was an advocate for greater leadership in water management, and worked with individuals and communities to promote change in their use and respect for water. At the Great Lakes level, she was part of a small team of experts that developed an integrated plan for the management of the north shore of Lake Ontario. She was a member of the Environmental Commissioner of Ontario’s Multi-Stakeholder Advisory Committee, the 2001 recipient of the Canadian Water Resources - Ontario Chapter Distinguished Service Award, and honoured in 2010 with the Conservation Pioneer Award by the A.D. Latornell Symposium. Vicki retired from her service with the Trust in Spring 2018. We are indebted to her for her tremendous contribution to our organization. David is a recent graduate of Engineering Technology. His experience includes working with the Town of Grimsby, including assisting with the development of their Greenbelt Route. He assists the Waterfront Regeneration Trust with administering the website, updating web resources and content management, and is coordinating the Trail expansions on the Lake Huron North Channel, Lake Huron and (Phase I) Georgian Bay. David is an outdoors enthusiast and occasional adventure racer, with a particular love of paddling, hiking, and cross country riding. He one day hopes to complete a ride from Hamilton to Thunder Bay, a goal which his work on the LHNC route will help accomplish. Jo is a dedicated swimmer, runner and cyclist who loves to explore by bike. She has extensive experience as a senior manager for a wide range of major sporting events including running and cycling. She is the Tour Director for the Great Waterfront Trail Adventure, an annual fully supported recreational bike ride of the Waterfront Trail, and the cornerstone of the Trust’s public engagement program. She works with hundreds of community partners, corporations, service and bike clubs to deliver a safe tour brimming with WOW experiences of the Wonderful Ontario Waterfront. Jo is also responsible for developing the Trust’s volunteer program. She has extensive work experience in sport, media, tourism and project management.